As a matter of full disclosure, you should know that I am a man, but that doesn’t preclude me from highly appreciating the glory of Wonder Woman. 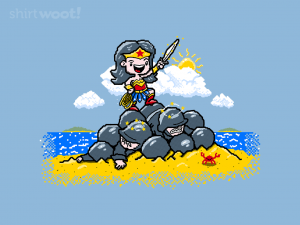 You do not mess with Diana of Themyscira. You might as well be in No Man’s Land if you go up against the godkiller herself. For no man can defeat her. I mean, pretty much no woman can, either, really. I haven’t seen anyone able to beat her. Wrap this cloth around your torso and feel invincible!